Smile by Raina Telgemeier. Scholastic, February 2010. This coming-of-age true story is sure to resonate with anyone who has ever been in middle school, and especially those who have ever had a bit of their own dental drama. 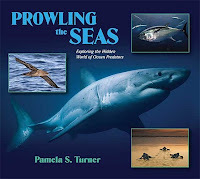 Prowling the Seas: Exploring the Hidden World of Ocean Predators by Pamela S. Turner. Walker Books for Young Readers, October 2009. From the surface of the ocean, it’s hard to see any visible signs of life below. But this remarkable ecosystem is teeming with life—life that is increasingly under environmental stress. And it is often the predators that sound the earliest warning signs. By tracking a wide variety of ocean predators, the Tagging of Pacific Predators (TOPP) project provides essential cutting-edge information about the state of the ocean’s health and the challenges facing all its inhabitants. Acclaimed science writer Pamela S. Turner takes readers along with four predators—a leatherback sea turtle, a bluefin tuna, a great white shark, and a Sooty Shearwater—on their remarkable journeys. This full-access look will change the way readers view our blue planet. Saving Maddie by Varian Johnson. Delacorte Press, March 2010. Joshua Wynn is definitely what you would call a good guy. He's a preacher's son who chooses abstinence and religious retreats over crazy nights and wild parties. Instead of joining his high school basketball team, Joshua spends his time leading the church's youth group. One Sunday, Joshua's mind drifts from his father's sermon to a beautiful girl in the fifth row. She's gorgeous, wearing a dress cut down to there, and she looks like the little girl he crushed on as a kid. It turns out that Maddie Smith is back in town, but instead of throwing her a welcome-back picnic, the community condemns her for her provocative clothes and the rumors about her past. According to Joshua's parents, she's on the need-to-save list, though his mother isn't sure he's the one to do it. Still, Joshua can't stop thinking about Maddie's purple-painted lips, and he wants to help her find who she really is. But can Joshua save Maddie without losing himself? Looks like great books in my mailbox this week! How about you? Did you get anything exciting in your mailbox or from the bookstore or library this week? Ooh all of those sound good! Haven't seen any of those in my mailbox yet, but we'll see what this week brings! fantastic books this week! i hope you enjoy them all! happy reading! Prowling the Seas looks great- I know the kids in my class always enjoy books about animals, especially ones with photos. Enjoy! I hadn't heard of Saving Maddie. It sounds good! I'll have to keep an eye out for it. Happy reading! Great books you got this week. Smile looks really cool. Hope you enjoy reading all your books.